John Green has written his first young adult novel since The Fault in Our Stars and in many ways, it’s authentically John Green. This book wrestles with everything you don’t want to talk about, and in good Green humor, one female character is a whirlwind of excitement, drama, and prone to wild announcements about urgent crises such as her latest fanfic and irritating boyfriend. And then there’s loss. Loss of family, of friends, and ourselves with them. Death and disappearances are common themes in his books, and his characters often spend the majority of their time contemplating intricate subjects trying to make sense of their lives. 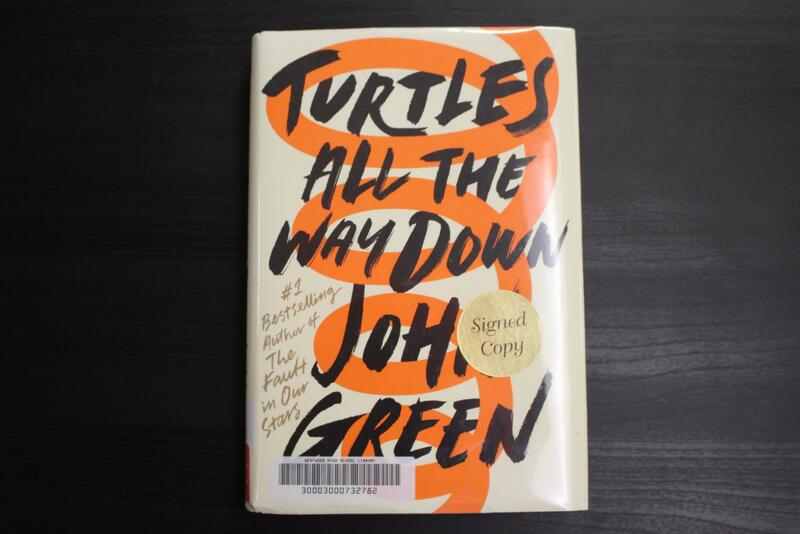 Turtles All the Way Down is arguably Green’s darkest and most realistic work. In The Fault in Our Stars, which is both a tragedy and ironic comedy wrapped up in a work of stunningly realistic fiction, Green deals with the ins and outs of life as a teenager cancer patient. There are few subjects more upsetting than kids with cancer, but this book is somehow darker than the last. Maybe not necessarily in the subject matter, but in the way it’s written. This novel is his hardest to read because of the shockingly real way it’s constructed. The main character in this book is Aza Holmes, who has anxiety and obsessive compulsive disorder (OCD). Aza’s OCD is difficult to understand, and even more difficult to read. People tend to think of OCD as repetitive, uncontrollable behavior, which in Aza’s case is partly true. She has a self-inflicted cut on her finger that she repeatedly drains and sanitizes to ease her worry, but her intrusive thoughts are her true enemy. If Green was writing in his usual way, he’d insert his own humor into Aza’s thought spirals, or as she calls them “light-swallowing wormholes,” but part of what makes this book so different from Green’s other works is that the reader gets no relief, and neither does Aza. Mental illness has been at the forefront of discussion recently. With it becoming a more widely accepted topic to talk about publicly, books, newspapers, and even TV shows have all begun commenting on the issue. Even celebrities have begun makes cameos, and discussing it on their social media platforms. However, Green encapsulates mental illness in this work of fiction unlike any other author has been able to before. Overall this book is a great read for anyone who would like to understand what it’s like for someone battling mental illness. The end is surprising and moving in ways you wouldn’t expect. You don’t have to be suffering like Aza to understand and relate to this story, you only need to be human.